Sri Aurobindo (1872-1950), born Aurobindo Ghose in Calcutta, is the Indian spiritual teacher of greatest relevance to the Church of Light due to his long partnership with Mirra Alfassa Richard (1878-1973), “the Mother,” who had been a disciple and student of Max Theon. As a Frenchwoman of Jewish ethnicity and roots in the Islamic world (Turkish-born father, Egyptian-born mother) she was complementary to Aurobindo in developing a philosophy and movement of global reach and significance. Although there was tremendous antagonism between some early Theosophists and some early leaders of the Hermetic Brotherhood of Luxor, the writings of C.C. Zain evidence respect for those of H.P. Blavatsky despite disagreements. 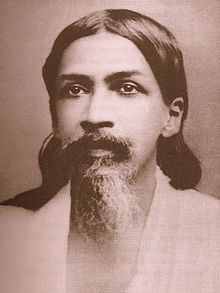 Likewise, Aurobindo was basically respectful of Theosophy, but he took strong exception to the authoritarian tendencies he witnessed in the early 20th century. Around 1911 he wrote a commentary that remained in manuscript form until published in 1997. The entire text of The Claims of Theosophy is now available online. I reproduce below the passages that seem especially relevant to the issue most crucial to the future of Theosophy. It is not that Theosophy is false; it is that Theosophists are weak and human. I am glad to believe that there is much truth in Theosophy. There are also considerable errors… We must accept the Theosophists as enquirers; as hierophants and theocrats I think we must reject them…If Theosophy is to survive, it must first change itself. It must learn that mental rectitude to which it is now a stranger and improve its moral basis. It must become clear, straightforward, rigidly self-searching, sceptical in the nobler sense of the word. It must keep the Mahatmas in the background and put God and Truth in the front. Its Popes must dethrone themselves and enthrone the intellectual conscience of mankind. Obscurantism (French: obscurantisme, from the Latin obscurans, “darkening”) is the practice of deliberately preventing the facts or the full details of some matter from becoming known. There are two common historical and intellectual denotations to Obscurantism: (1) deliberately restricting knowledge—opposition to the spread of knowledge, a policy of withholding knowledge from the public; and, (2) deliberate obscurity—an abstruse style (as in literature and art) characterized by deliberate vagueness.…in restricting knowledge to an élite ruling class of “the few”, obscurantism is fundamentally anti-democratic, because its component anti-intellectualism and elitism exclude the people as intellectually unworthy of knowing the facts and truth about the government of their City-State. The best corrective of error is an honest and open-minded examination of all facts subjective and objective. Misleading secrecy has given the death blow to numerous organizations. The cant about “Masters” must be silently but firmly put down. Let the devotion and service be to that Supreme Spirit alone of which one is a part. Disclaimer: This blog is not the website of the Church of Light although linked to it and sponsored by the CofL. No one in the CofL has any prior knowledge or approval of anything I post, or has ever tried to influence the content in any way. So in hopes of preventing their being blamed, I have been very discreet about the contemporary Theosophical Society heretofore. The authorial voice of Sri Aurobindo in this passage moved me to comment on lasting issues he raises. I’m an independent historian and don’t presuppose agreement or disagreement from any group; just want to offer relevant evidence to all interested individuals. Aurobindo’s remarks are relevant to the present circumstances. This entry was posted in Uncategorized and tagged Aurobindo Ghose. Bookmark the permalink.